From scorching summer highs to freezing winter lows, you deserve a heating and cooling system you can depend on. 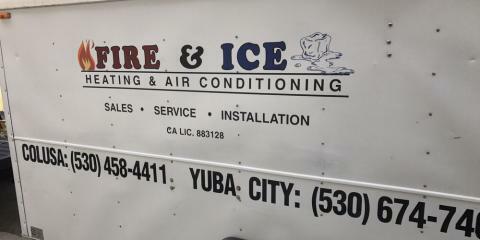 At Fire & Ice Heating & Air Conditioning in Colusa, CA, their experienced team specializes in the sales, service, and installation of dependable HVAC systems. No matter the problem, you can trust this locally owned and operated HVAC contractor to handle any job with ease. Whether you’re in need of simple furnace repairs or a new air conditioning unit, this licensed HVAC contractor services all makes and models. With years of training and knowledge under their belts, their team quickly and accurately diagnoses and repairs the issue, so you aren’t without the comfort you deserve for longer than necessary. As a licensed, bonded, and insured company, you can rest easy knowing you and your property are protected throughout the entire process. Receive the comfort you deserve year round when you choose the superior services from the area’s leading HVAC contractor, Fire & Ice Heating & Air Conditioning. For more information on their financing options or to receive a free estimate for your new installation, call (530) 458-4411 today.